The Dyson Supersonic Hairdryer | Worth the Hype or Just Hot Air? | hi Sugarplum! The Dyson Supersonic Hairdryer | Worth the Hype or Just Hot Air? Today’s post is a little different, but I’ve had a lot of requests for more beauty and hair content, so I hope you’ll like it! I get a lot of product pitches from companies, and turn down roughly 90% of them because I’m so particular with what I endorse. I want my opinion to mean something, and for you to trust my word. Y’all are my girlfriends, and girlfriends are honest in their opinions and recommendations, right?! If I won’t spend my own hard-earned money on something, I’m never going to suggest that you do! That said, when eBay reached out and asked if I’d be willing to talk about their Dyson Outlet, I was intrigued (eBay has a Dyson Outlet?!) and clicked over to see what they offer. Of course I found tons of listings for vacuums at deeply discounted prices, but also their Super Sonic Hair Dryer! 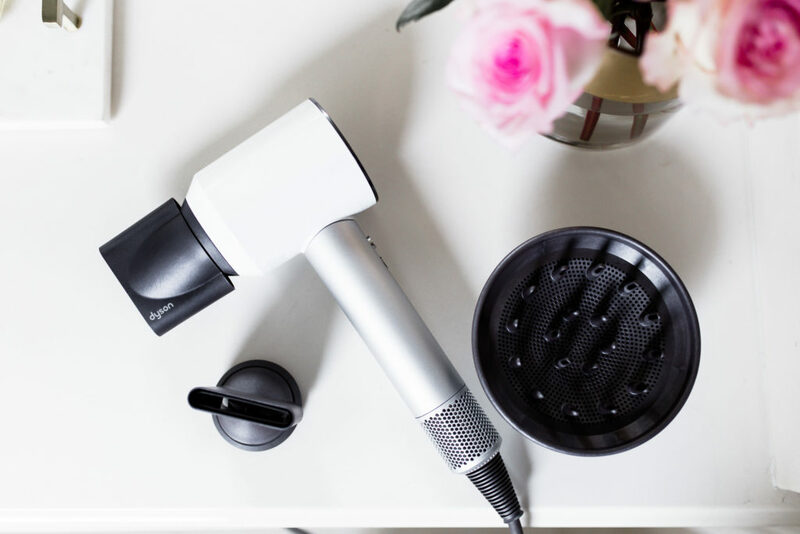 The same hair dryer that’s all the buzz in the beauty world, and on every beauty editor’s ‘Best Of’ list. So I asked on Instagram and Facebook which you would rather I review…the Dyson Animal Complete Vacuum or the Dyson Super Sonic Hair Dryer. And here’s the deal…I fully expected to like the Supersonic, but not to see much difference between it and my existing hairdryer (that I love). Yeah well, so much for that. After the very first use, I was obsessed and felt like I belonged in a hair commercial. I might have even used the term ‘cornsilk‘ when describing my hair to friends. 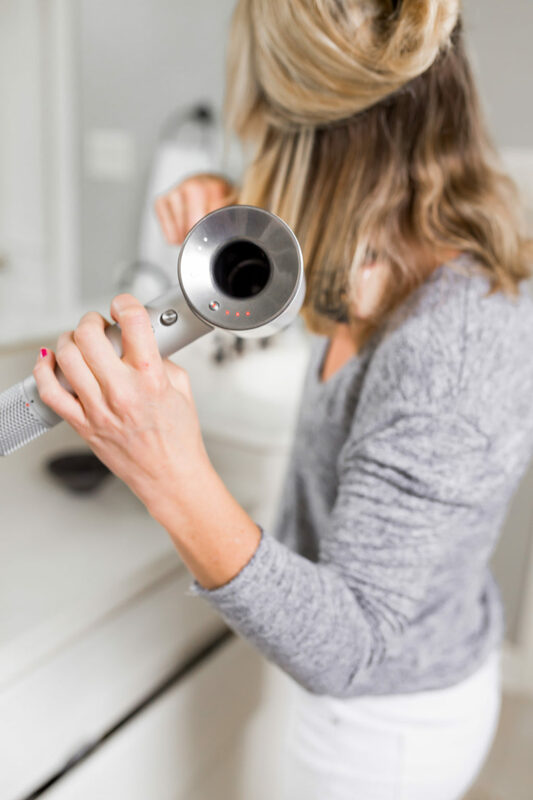 A few days later, I repeated the same process with the Dyson Super Sonic Hair Dryer (using all the same products, find them in this post)…but it took just under 9 minutes, and my hair was as smooth and shiny as if I’d stepped out of a salon. No joke. Even when I just rough dry it (no brushes), it’s smoother than a full blow-out with my other dryer (and takes even less time). And the funny thing is, I was equally excited and annoyed!! 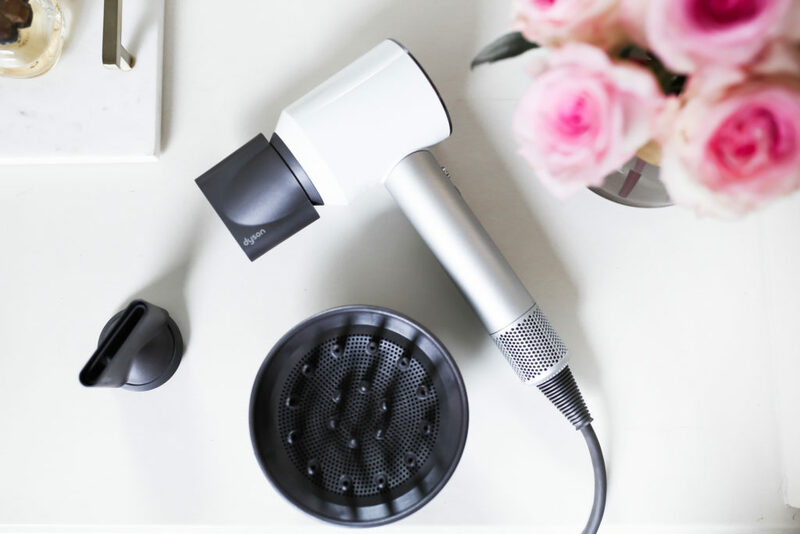 I wasn’t prepared to join the hype, and couldn’t believe I was genuinely impressed, and beyond smitten, by a hair dryer. So do I recommend you buy it? That’s impossible for me to say! If you rarely dry your hair, or have smooth, straight hair already, it’s not going to hold much appeal to you. 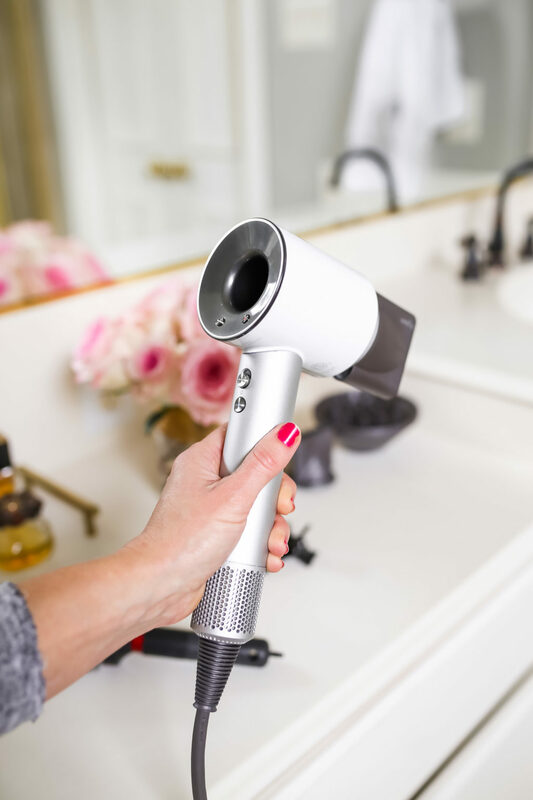 But if you have coarse, thick, damaged or fragile hair, or you always dry it completely, then this fancy dryer is worth every single freaking penny! And trust me, it pains me to admit that! 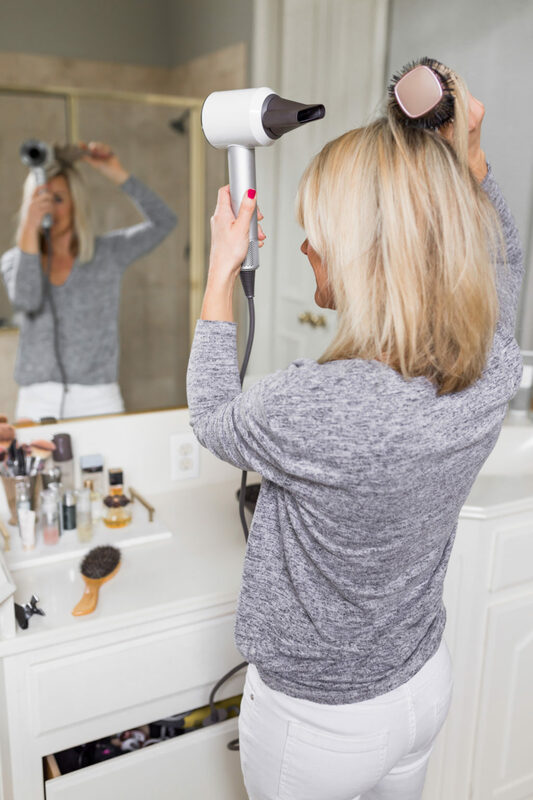 Now it’s your turn…have you tried this dryer? Are you curious to try it now?! Find more hair & makeup posts here. Okay, Cassie! It’s official. Your post sealed the deal. I need that hair dryer! We bought it for a daughter, for Christmas, and she is still gushing about no longer needing products or a straightener! Noticed in your previous posts your fantastic straight shiny do. 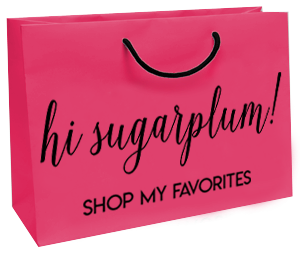 You looked like a completely different Sugarplum! What a product. Especially for rushed mornings & fragile hair. I’d take the hairdryer over the vacuum-it’s way too heavy for me. Who needs weight training pushing that vacuum around! Thanks for the Ebay tip! I have one and I do like it but I’m not sure if it’s slight advantages make it worth the huge cost. It’s the kind of thing I was happy to get as a gift but I don’t know if I would buy one myself. Maybe it depends on the type of hair? You don’t mention it as a con but I find the weight distribution in the head to be sort of offputting and awkward. That said, it’s definitely a good product and I’m happy I have one. I guess I was expecting more because I absolutely ADOOOORE my Dyson vacuum. The square is a cross between a paddle brush and round brush…gives a nice, smooth dry without too much curl/bend in the hair. Okay. That’s it. Now I have to have it. Your hair really does look shinier and smoother!!!!!!!! Your post sealed the deal for me too. I’ve been looking for an awesome hair dryer and was very curious about this one but just couldn’t justify the price. I just ordered a refurbished one on eBay. Thanks for the tip! I’m hoping I’m as impressed as you are. Let me know what you think, Trisha!! I know it’s a hefty price tag, but considering I dry my hair 3-4 times a week, it’s a justifiable investment in my hair!! [Hair designer and colourist here for over 40 years]… this IS over priced and over hyped. I tested this dryer when it first appeared, and found it lacking for many hair types, but of course the appearance draws attention and that in a salon can be reconciled for the price. 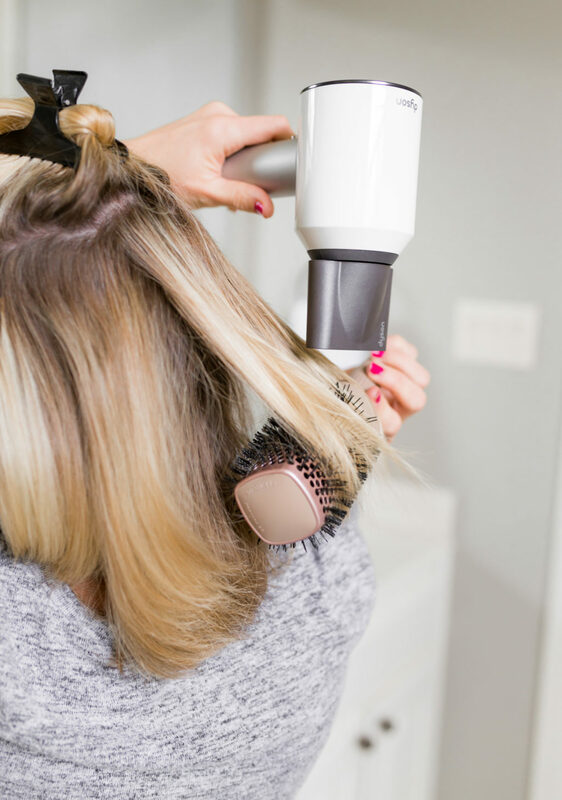 Technology and price caught up years ago, when pulverized tourmaline was placed into the heating elements of professional dryers (Dyson does not include this element) which allows hair strands to heat from the “inside-out” to prevent damage and allow for silkier blow-outs. 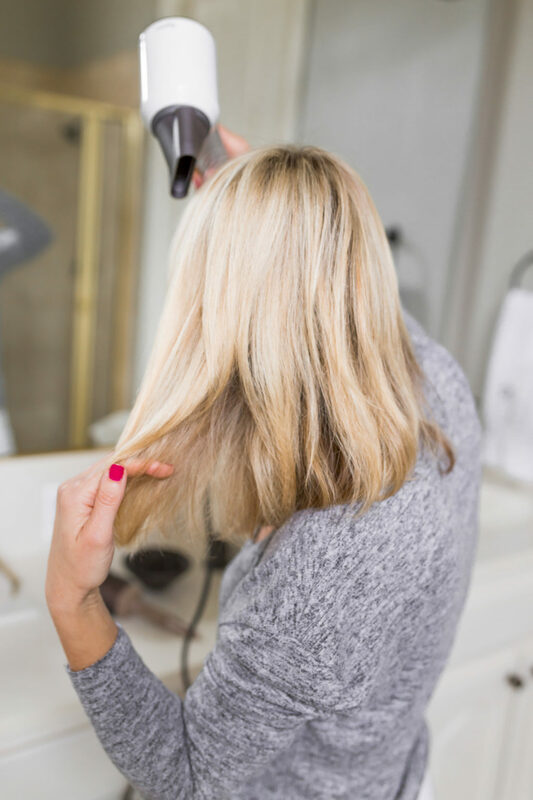 No dryer can prevent damage….as each individual(person) must direct the air flow in the direction of the hair’s natural flow or the cuticle layers will be “ruffled” and create the event of damage to it’s entire protective layer. The words “ionic” you see added to the dryers you use mean that it creates a negative charge which is the natural charge of hair, other conventional dryers give a positive charge(as well as hair fixatives may also) and positive vs. negative creates static…THAT reaction may create volume, but also may damage the strands as you brush through when styling hair. Also on that note, the ceramic based(housing and mechanics) dryers may decrease static, but are very heavy to handle and hold above your head for any length of time. 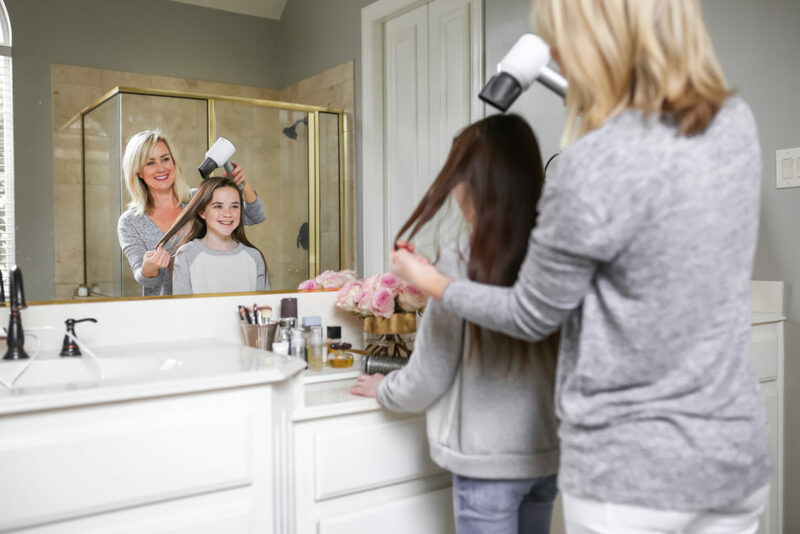 Save your $$$…find a lightweight, tourmaline, ionic blow-dryer with a long cord and clean the intake weekly and you will be satisfied with your dryer for years to come. p.s. sorry for the long rant, so much I could impart here, but that is for another blog! Thanks for your input, C2!! I appreciate your expertise and opinion! I agree! It’s just good marketing. I tried my daughter’s, that she bought with her own money, and it is very tiring to hold up over your head for the time required to dry longer hair. I saw no difference in the smoothness of my hair, either. Thumbs up. This was very helpful. Interesting. Thanks for explaining what all those terms mean. Very helpful! I have short hair now, (also very fine) so a Dyson would be wasted on me. You recently touted the Dry Bar dryer…comparisons? 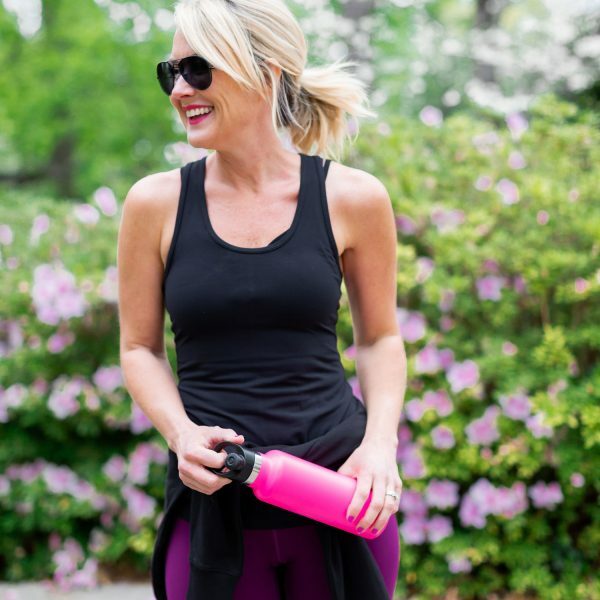 And I was referring to the Drybar dryer in this post, I have it and love it. It’s a great dryer and worth the money, but the Dyson is better. Just my opinion! Is it a coincidence that my hair dryer dyed literally TODAY!!!!! Ugh! I just don’t know if I can justify the price!!! I do have thick, frizzy hair and get keratin treatments every 4 months s maybe the dryer would replace that cost!? I’ve owned this dryer for almost a year now and just love it! I was (thankfully) able to get it for $100 off at Ulta, during one of their 20% of everything sales! It was a hard pill to swallow even with that reduction, but has been totally worth it! I get that the lady would grab it first in case of fire! Totally recommend it…I haven’t used a flat iron or curling wand on my hair ever since getting it! That’s awesome…and great tip about the Ulta sale! Thank you for being honest. That looks so cool! Maybe eventually i’ll upgrade to it! So fun to read your review! Dyson was running an ad on Instagram and it was kind of funny to read through the comments. Reviews were all over the place and some of the comments on the price were hilarious. Good to know it worked for you and was worth it! I have super fine straight hair which only takes 5 minutes to blow dry anyways, so I don’t think this dryer is for me. 😉 Your hair looks so good though! My husband got me one for Christmas last year and it was the best present. I have long thick hair and I wash it 2-3 times a week. Since using the hairdryer I have cut the time in half to dry my hair. Don’t have to spend as much time curling it after it is dry and my hair feels healthier. Totally worth it for me! That’s amazing!! I hadn’t thought about my hair health actually improving, too! Bonus! I drank the kool-aid in December when Sephora had their 20% off sale. It’s crazy expensive and it’s amazing how much time it saves me and how nice my hair is after using it. I feel like the investment overtime will be worth it, because of the time it saves me drying my hair. The one downside for me is that it’s hard to travel with because it’s bigger when I need a blow dryer. 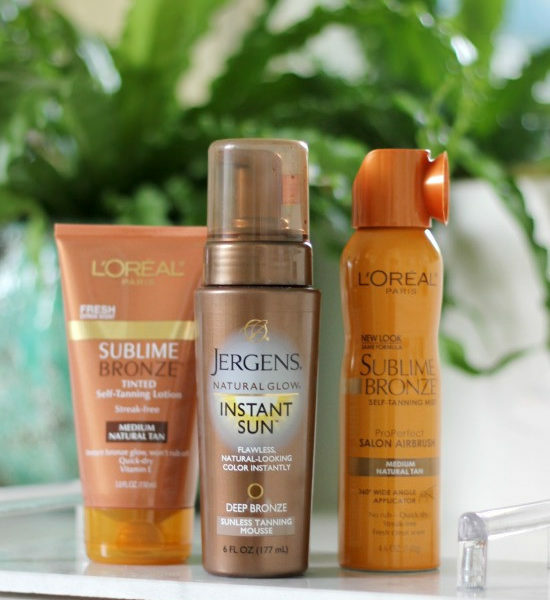 The time savings is great, and I found I’m able to use less heat tools on my hair, too! I can’t image that I would use it. I bought a Dyson vacuum and it lasted less than a year. Just looked on Amazon for the reviews on the hairdryer and there’s 30% 1 star reviews on it. I’m OK with a small % of negative reviews, but given my past experience with Dyson I wouldn’t invest that kind of money on their products again. Oh, that’s so disappointing!! I’m sorry the vacuums pooped out on you! I would buy the Dyson if I could travel with it out of the country but since it is not a dual voltage dryer it means I would need to buy two dryers. I thought my Dyson vacuum cleaner was good until I tried a Miele vacuum cleaner. No comparison. The Miele is so much better in terms of wear and tear on rugs plus does a superior job of cleaning. I have to tell you that I was super excited to read an honest post about this dryer. I was intrigued but hesitant about the price point. That said as a mama with a toddler who works full time and is currently in grad school – time is money. Anything I can do to shorten, streamline, make easier is a win in my mind. Sooo…after reading your post, I talked about it at work and turns out one of my colleagues had one. She brought it in the next day so I could just see it, play with it a bit and get a sense for whether it is worth it. 2 days later – the Dyson is in my bathroom. Today was the first day I used it and I have two words to sum it up. Game Changer. I have a lot of hair but it’s super fine that is well past my shoulders. I also color it so it tends to be on the dryer side even with an Olaplex treatment every few months. It literally took me 5 minutes to dry my entire head and it was actually smooth enough for me to walk out the door this morning after a quick swipe of the flat iron on my bangs. I’m thinking I was done in 10 minutes or less. Yep, game changer. This turned into a giant comment but I just wanted to do a shout out thanking you for your review. Not sure I would have really looked at it without it. 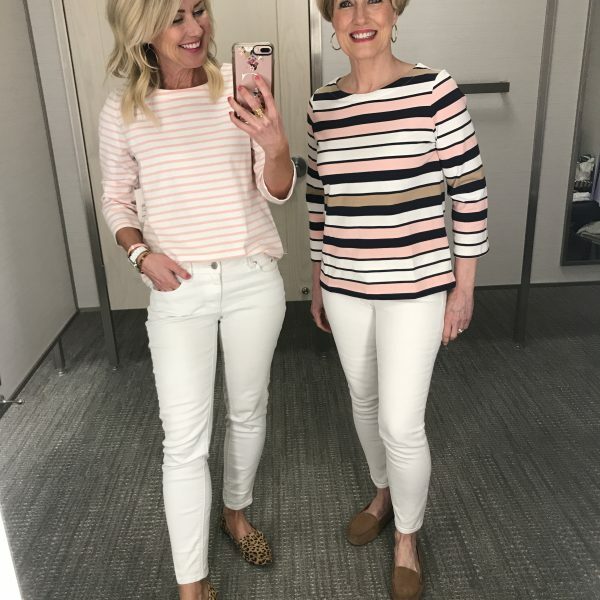 I love this so much…and am thrilled you love the dryer!! I always strive to be objective and fair in my reviews and what I recommend, but it wasn’t hard to sing the praises of this one!! Just bought it today with the sale going on at Sephora! So excited to try it! I bought it for myself, reluctantly paying full price. I really do like it. I just got one for my daughter for Christmas but saved 20% by signing up for an Ulta credit card. I think that was totally worth it! I bought on eBay this summer through your review. Amazing hair dryer, but it quit working 4 months later . Just decided not to turn on, and eBay only offers 30 day policy . Bummer ! Woulda Coulda Shoulda…. buy it new and get warranty . I didn’t love it for the money. I have thick, curly, coarse hair and yes, it dried it faster, but I didn’t feel like it was as smooth. I ended up returning it. I bought the Drybar dryer and love it!